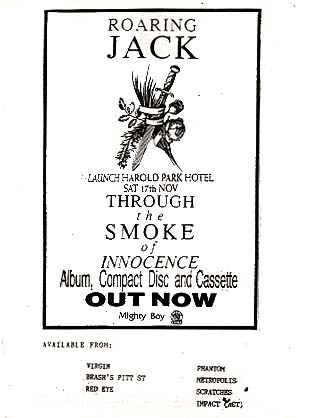 This one's from the launch of Roaring Jack's second full-length album, Through the Smoke of Innocence. It was launched at the Harold Park Hotel in Glebe, Sydney on 17 November 1990. I remember this as a particularly enjoyable night, especially when Roaring Jack fan Geoff House bought me a copy of this new album and had it signed by all the band members. Thanks - I have never forgotten that, Geoff!